Snake River Dike – Along highway 22 between the towns of Jackson and Wilson (on the way to Teton Village) there is a nice recreational path along the scenic Snake River that offers beautiful forest and river views as well as ample wildlife such as moose, deer and a variety of birds. Although this path is mainly intended for people walking, jogging and cycling, it provides a flat, easy spot for snowshoeing and is perfect for beginners and families with young children. There is a parking area near the bridge, or you can simply park in any of the retail lots nearby. Afterward, head out Moose-Wilson Road to Q’s Roadhouse Brewery for a pint and an app, or continue on highway 22 to Nora’s Fish Creek Inn in Wilson to warm up by a pot-belly stove with a hearty portion of their award-winning Huevos Rancheros. 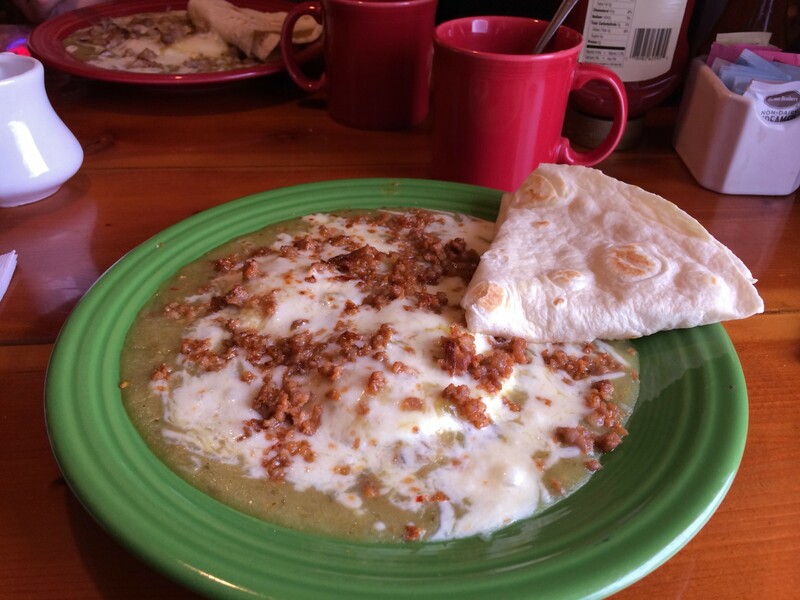 Hot and gooey Huevos Rancheros at Nora’s Fish Creek Inn. 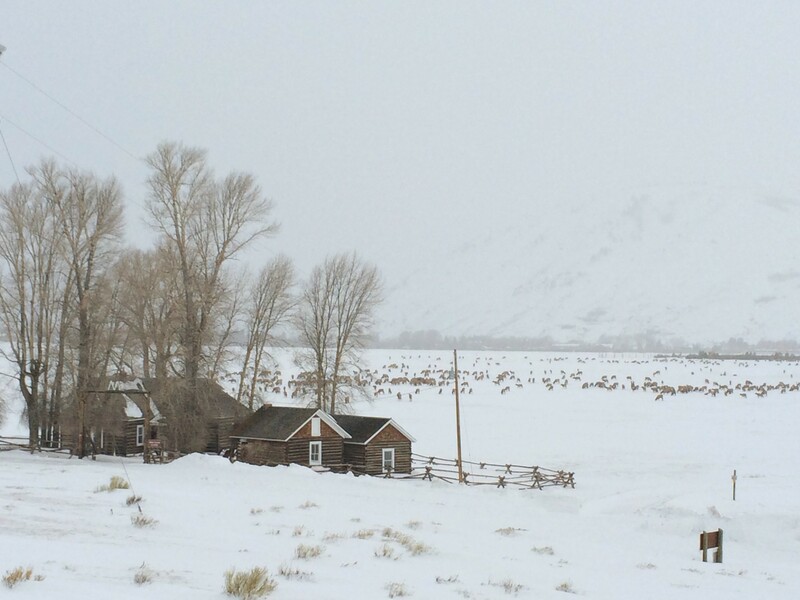 Elk Refuge – For a behind the scenes look at Jackson’s National Elk Refuge, grab your snowshoes and head out Broadway to Ntl Elk Refuge Road for another flat, easy trek. Park along Broadway just past the hospital before you start your hike along the Refuge Road, which is maintained but unpaved. From here you can see the herd on your left, and as you get closer you’ll also see bighorn sheep, mule deer and possibly antelope in the hills on your right. Jackson Hole National Elk Refuge. Be sure to stay near the access roads and keep your distance from the elk (if you want a closer view, consider taking a sleigh ride from the station on the opposite side of the herd). You’ll pass the quaint Miller homestead that has been preserved by the historical society before you turn around for this nice out and back trail. 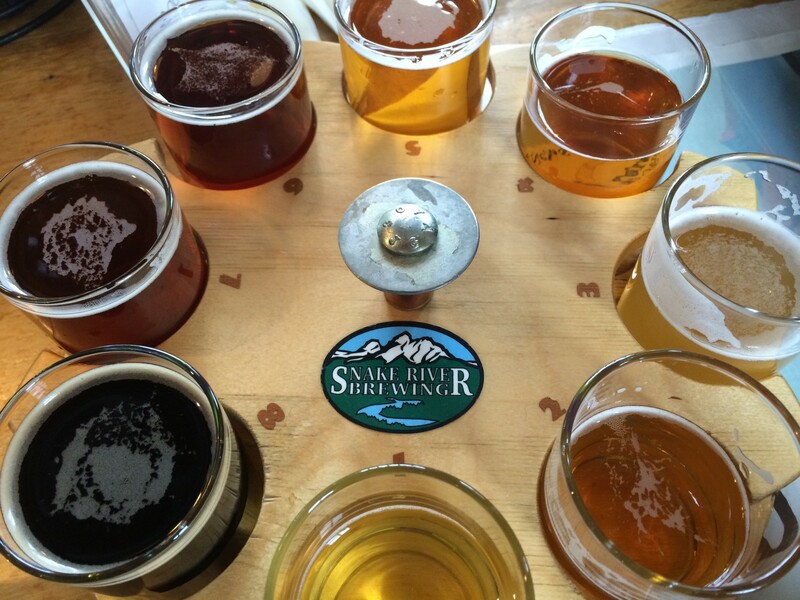 Check out the Snake River Brewery back in town to re-fuel with an après-snowshoe beer flight and a juicy burger. Or, if you want to stick with the elk theme, try the sausage sampler. Snake River Brewery sampler flight. 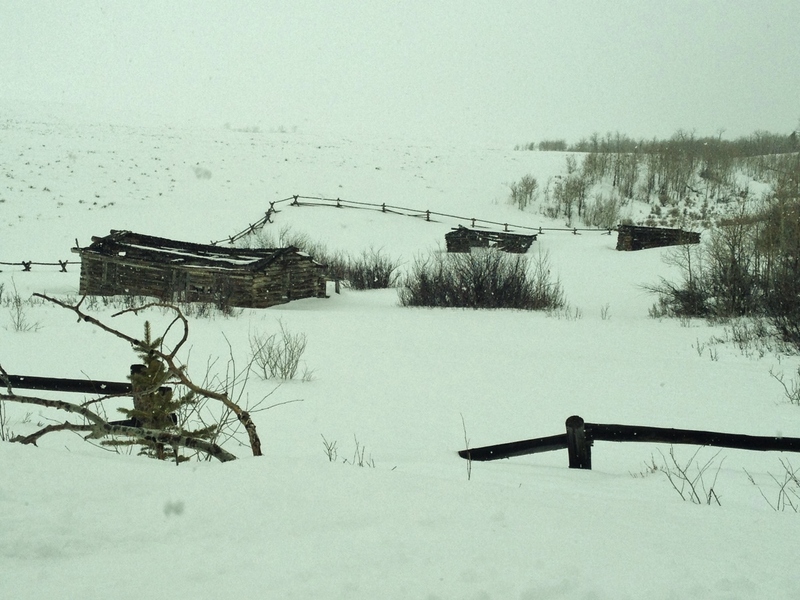 Antelope Flats and Mormon Row – In the summer, Antelope Flats Road is a scenic drive along the Gros Ventre River that takes you out to historic Mormon Row, a ghost town-like area of abandoned homesteads and barns. In the winter, this road is often closed because it’s piled high with snow—perfect for snowshoeing! Abandoned homestead on Antelope Flats Road. Take highway 26 north out of town and turn right on Gros Venture Road. You’ll get another view of the elk refuge, and also be sure to keep an eye out for moose, deer, antelope, bighorn sheep, eagles and swans. Drive until you pass the town of Kelly, Wyo. You can park in Kelly, or, if the road is still open, look for the parking area at the flats. Don’t forget your camera! There’s not much in the way of bars and restaurants way out here so pulling off along the river on your way back for a tailgate picnic is your best bet. You’ll pass the Bunnery Bakery and Restaurant on your way out of town which has a nice selection of homemade, all natural soups, salads, sandwiches and sweets that can be packed up to go. 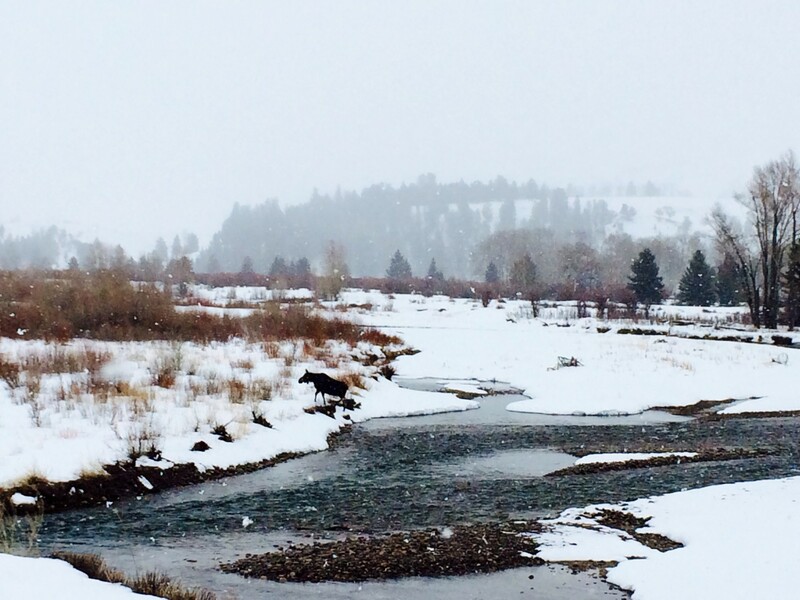 Moose crossing the icy Gros Ventre River. Grand Teton National Park – Just 15 minutes past Jackson Hole Mountain Resort is an entrance to the majestic Grand Teton National Park where you’ll find a plethora of snowshoe-ready trails and hikes. This National Park System brochure is a wonderful guide to a variety of trails that will help you plan a fun day of snowshoeing for all skill levels. Try the popular Jenny Lake and Swan Lake trails for an easy, scenic trek and the Taggart Lake trail if you are looking for a good climb. After working up an appetite in Jackson Hole’s natural playground, swing by the Mangy Moose in Teton Village for a heaping pile of nachos and live music. 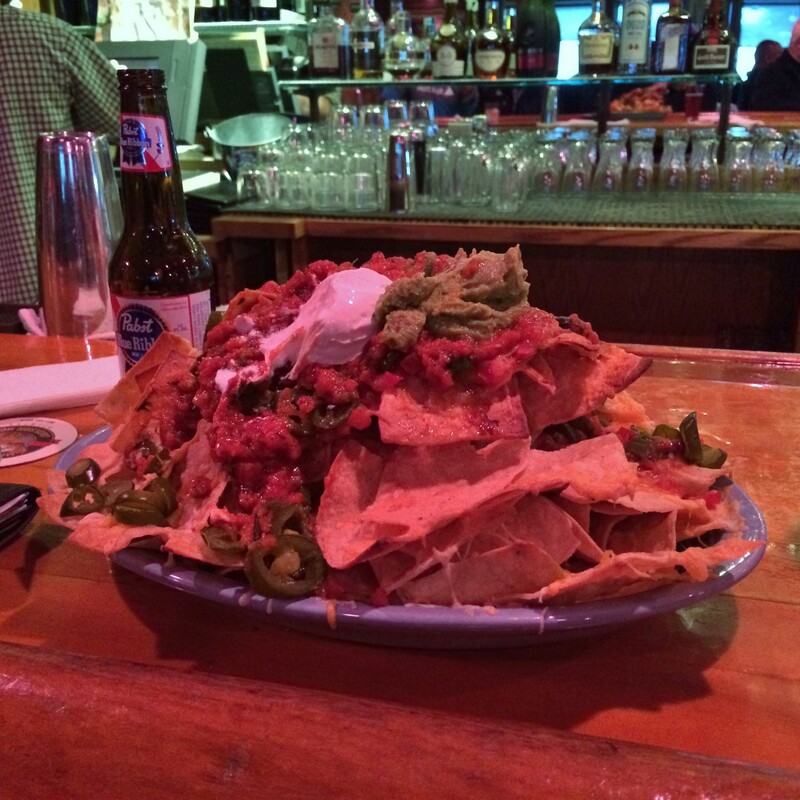 Bison chili nachos at the infamous Mangy Moose saloon. Togwotee Pass – This mountain road crosses the Continental Divide providing spectacular views of Jackson Hole Valley and beyond. A quick 30-minute drive from Jackson will get you to the top of the pass, and you’ll see plenty of trail heads and plowed pull-off areas along the way. 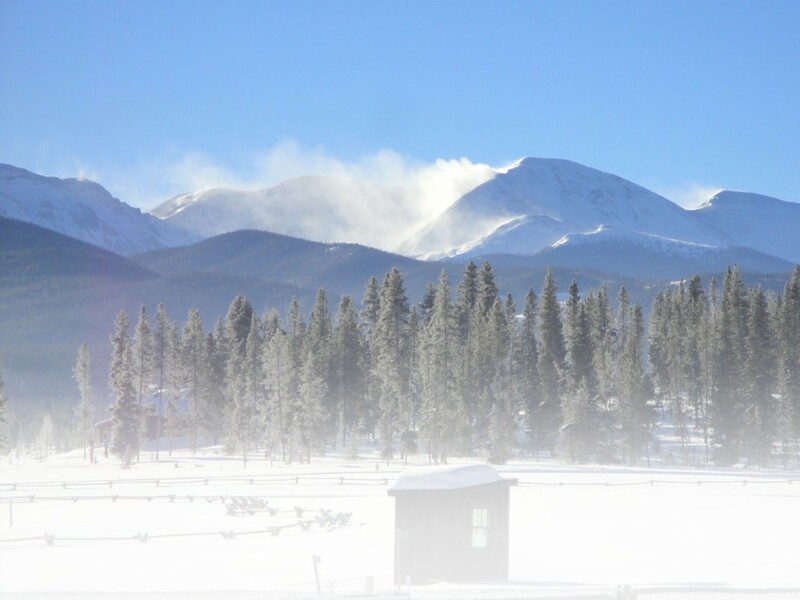 This is typically a popular spot for snowmobiling and back country skiing, but there’s no reason you can’t take advantage of all that powder on snowshoes, too! Expect these trails to be a little more on the steep and deep side, and always be sure to check weather and avalanche conditions before attempting any back country hike. Swing by the Togwotee Mountain Lodge, originally established as a place to feed crews breaking ground on the first road over the pass. The lodge has two restaurants on-site and also offers a boxed lunch service if you prefer to eat on the trail. The powder in Jackson Hole is second to none! With more than 400 inches of annual snowfall, you’ll want to make sure you use snowshoes that are more advanced and possibly even a size larger than you would normally wear to handle all that powder. Adjustable trekking poles, sunscreen, breathable layers, snacks and an ample water supply are also advised, even for seemingly quick, easy jaunts. Keep your camera handy for wildlife sightings, but always maintain a safe distance (especially from the moose). Remember that National parks and forests are meant to be pristine conservation areas and that no domestic animals are allowed and that “leave no trace” policies are strictly enforced. Many of these trails are popular with cross-country skiers, so play nice and stay off of their tracks. 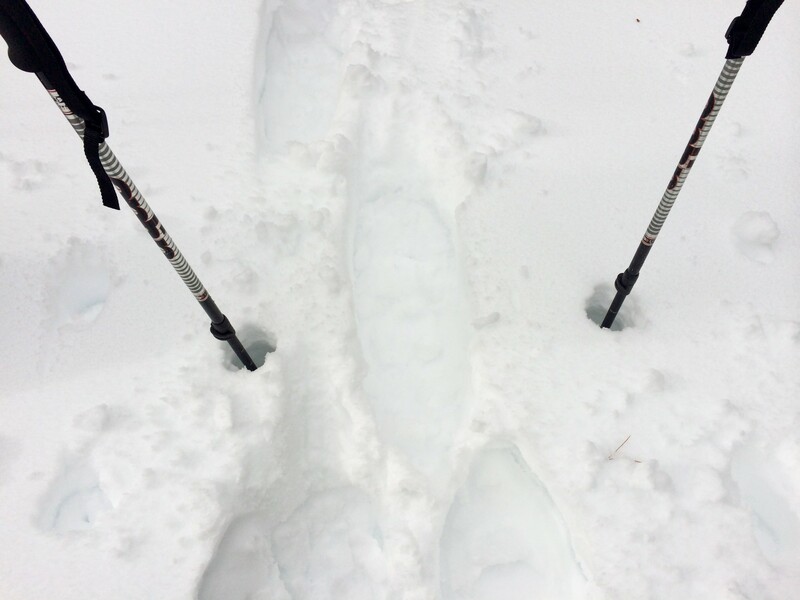 Always snowshoe parallel to ski tracks or break your own trail. For more information on Jackson Hole, visit http://www.jacksonholechamber.com. This entry was posted in Destinations, Features, Homepage Featured, New Destinations, New North America, New Site, New United States, New Wyoming by Katie Hearsum. Bookmark the permalink.